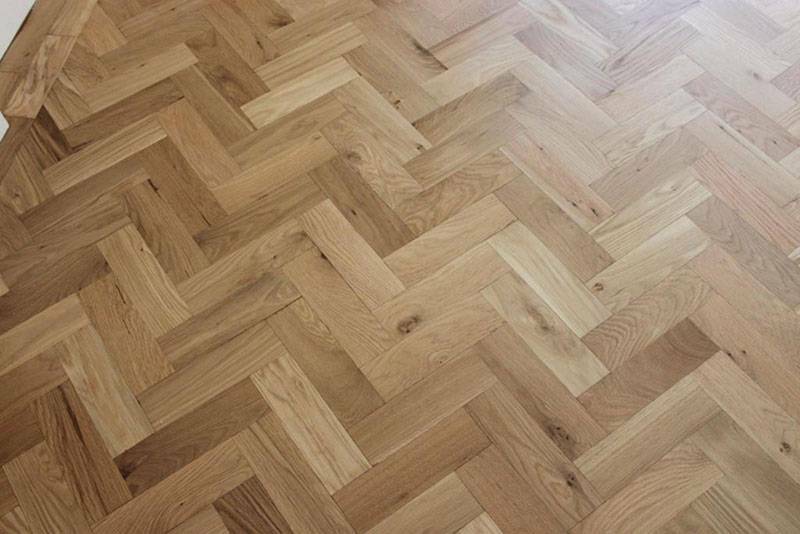 This Oak Herringbone Parquet floor was about ten years old, and had been laid in two rooms. Unfortunately it was an unattractive orange colour, with plenty of unwanted colour variations across the floor, due to the choice of finishing product previously used. 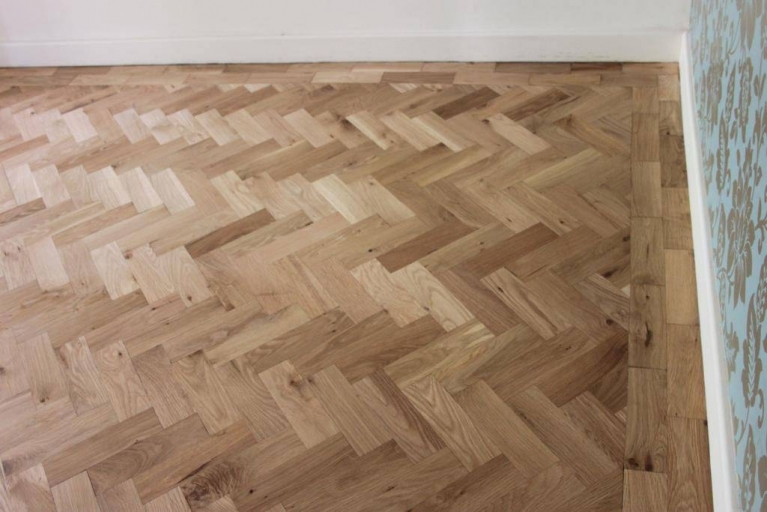 We were able to totally transform the floor and bring the Oak back to its natural beauty. Read more about how we carried out this restoration project below the photos. This project demonstrates exactly why we do not recommend the use of wood stain – especially on a floor that has already been installed. 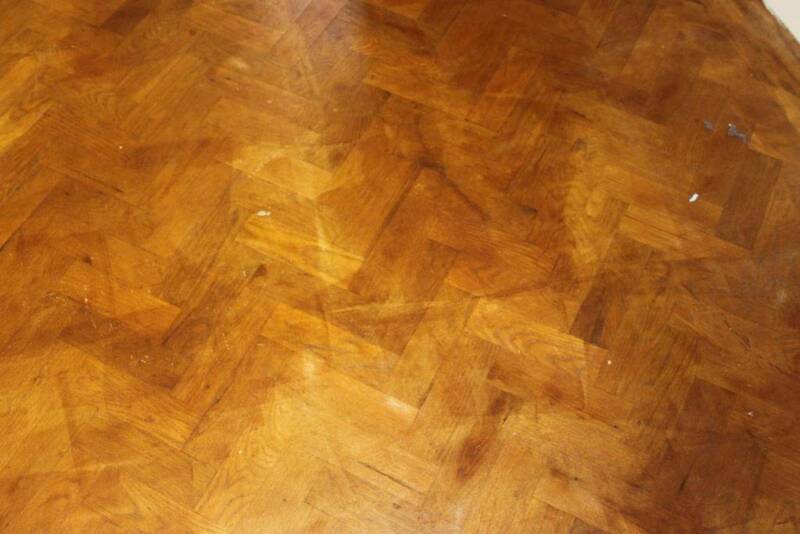 You can see from two of the photos above that someone had tried to colour this Oak parquet floor with an orange stain. The blocks did not take the stain well because it was not applied correctly. Stain is not an easy type of colour finish to use on wood; we prefer not to use it at all. If we are staining a board or block in our warehouse, we apply it using a sponge and then wipe the excess off with a cloth very quickly. This is because the stain starts to dry almost immediately, and is totally dry in a matter of minutes. When you are trying to stain a floor ‘in situ’ – i.e. one that has already been laid – you will always have problems, even if you are an expert. We’ve explained above that when you apply the stain you have to wipe the excess off very quickly, because the stain has already started to dry. That’s not so hard when you are dealing with one plank or one block on a work bench. But it is a completely different matter to apply the stain to just one parquet block in an entire floor, and it is also very difficult to wipe the excess off without moving some of it to neighbouring blocks. So, as you move along the floor staining the wood, it is incredibly easy to leave marks (caused by unwanted extra layers of the stain) all over the surface. You have to be very quick and precise to try to prevent this, even if you are experienced in finishing a floor in this way. It’s very challenging. This is why we always prefer to use hard wax oil with the stain integrated. It much easier to apply, to re-apply, and it leaves a better and far more even finish even when you use multiple coats. Find out more about our Custom Finishes. 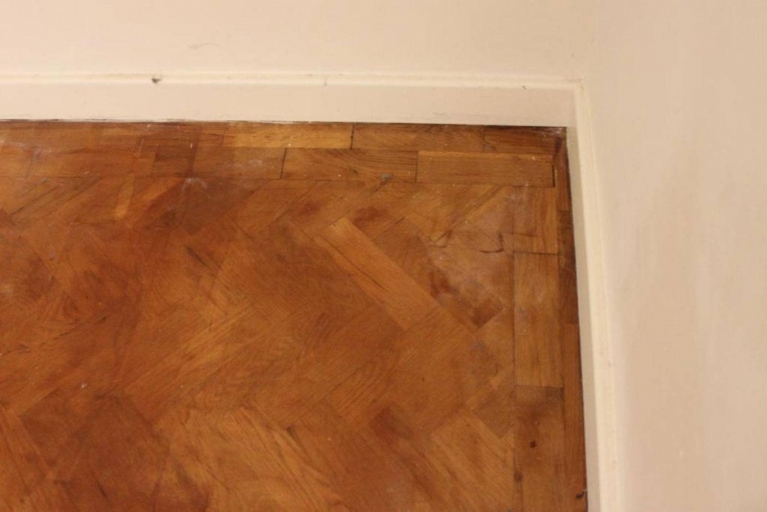 We sanded both rooms to remove all traces of the old and uneven stain, and and then sealed any gaps. Finally we applied two coats of hard wax oil. One person (Mursel, our founder) and three days to complete.